At the Kid’s Trunk Show, 10 year old Ella Kohlmann made her craft show debut with her totally enchanting polymer clay kitties. Pretty much her entire inventory was snapped up and I’m happy to say that I’ve got one of those little kitties on my bedside table. Apparently Ella inspired another young girl attending the Trunk Show to open up her own etsy store and thus, cupcakequeen11 (aka. Helana E.) was born. Remember pet rocks? 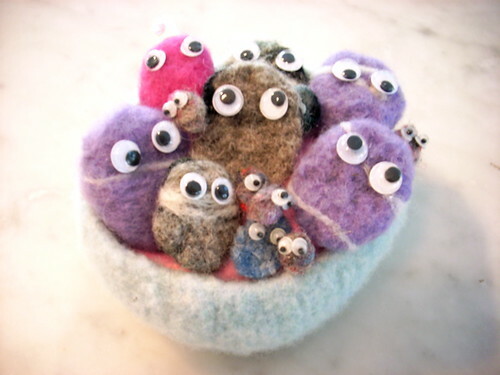 Helana makes darling hand-felted pet pebbles and each one comes with a traveling case. It is so exciting to see younger gals being so crafty and enterprising. Both Helana and Ella will be at the Holiday Trunk Show on December 7th selling their handmade goodies. Where did the idea for making pet pebbles come from? Helana : My mom started felting and she showed me the different things you could make including rocks. I remembered people talking about having pet rocks when they were younger and the idea just grew from there. Helana : I opened the shop in September of this year. Have you learned anything interesting from running your own store? Helana : I have learned in order to have a successful business you really need to market yourself to let everyone know about your shop. It is always a good idea to test out your product before you start your shop and take your time to figure out how much it costs to produce and ship. You have to be very organized so that your product is ready to be shipped right when someone orders. When you’re not making your pet pebbles, what else do you like to do? Helana : I enjoy dancing, theatre, knitting and I love to read, write and cartoon. In general I love crafting. What would be your dream job when you grow up? Helana : I really love to bake and right now my dream job would be to be a baker. I LOVE CUPCAKES!!!!! Helana : This year I would love The Gourmet Girl Cupcake Maker and craft supplies. These are adorable! I can’t wait to pick one up at the Holiday Trunk Show. And the Cupcake Maker is amazing – I love the sweet cupcake holder for transporting your treats! omgosh!! i love!!! these kids are pretty amazing!!! These little pebbles are just the cutest! I can’t wait to see the new collection at the trunk show! Those pet pebbles are so cute Helana! These are so sweet. What a great idea Helena. We’ll take 2! See you at the show! Congratulations Helana!!!! I just love your pet pebbles. You rock!! These are so wonderful!! I think we will need to get Jenna a pet pebble the next time we see you. Good luck with the Trunk show!